Mr. Ettore - it's your native Pittsburgher/Cleveland resident reader. Thanks for getting the word out on Mr. Clemente. As an insufferable Pittsburgh sports fan (albeit a young one) I'm always surprised by people my age having no knowledge of this man's contribution to humanity, the human spirit and the game of baseball. I'm proud that the Pirates beyond winning 2 world championships in the 1970's fielded (starting in 1971) the first exclusively African-American/Latino starting line-up. It wasn't all a bowl of cherries - I believe Clemente complained bitterly about Pittsburgh's social conservatism at the time. Today in Pittsburgh there is a park, a bridge, a segment of the outfield wall and a large statue in his memory. Thanks for yet another golden bio. recommendation to pass on to my grandmother. As a crusty Republican she is more partial to Carnegie and Mellon but every once in awhile I can squeeze through something different. The fact that she reads long, complicated biographies yet still finds Bill O' Reilly's books informative and entertaining is a sword in my side. What a marvelous grandson you are. Every woman should have such a gem looking out for her in her advancing years. It would lead to far more happiness and general health in the AARP crowd. 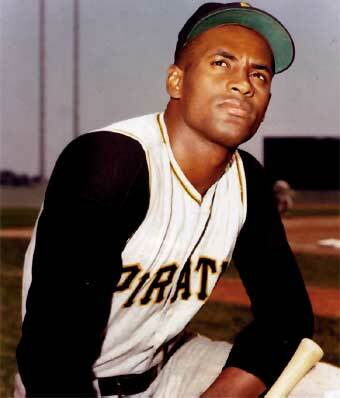 You're right about Clemente, of course. I happened to have begun watching baseball seriously just in time to catch about his last two years of play, but of course living in an American League city, and at a time when not too many games were on the tube, I probably only saw him play all of about a dozen games. But of course you didn't need to see much of him to appreciate how regally majestic the guy was, both as man and player. Watching Lebron or Michael Jordan at their soaring best is like watching great ballet or poetry come to life. And watching Roberto gun down a runner at third base from the far corner of right field with that rocket arm of his was a similarly goosebump-inducing experience. He STILL sets the standard for outfielders on that play, and I've never seen anyone who can match him. But of course the way he died, on a mercy mission for his native country, at the height of his own popularity and fame, and while he was stuck exactly on 3,000 hits, put him into a whole other stratosphere. With a death of such dramatic proportions, there seemed to be a divine plan at work, not unlike Lincoln being gunned down, Christ-like, on (Easter) Good Friday, just weeks after he presided over victory in a war that saved his nation. Lastly, let me mention this: the author of this book is himself a wonder. David M. is a Washington Post staff writer whose first book, "First in His Class," is still by consensus the best biography yet written of Bill Clinton. He later went on to write a book about the Green Bay Packers (which I haven't read, but which I nevertheless assume is also good). This is only his latest wonderful book, of which I expect there will be many more.